a. non-beekeeping group (including school group). B. Teaching WASBA approve course for beginning beekeepers. 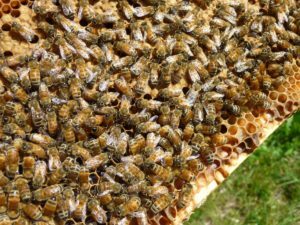 C. Publishing an article on beekeeping or related topic in a journal, newsletter, or other publication. b. Washington State Beekeeping Association. E. Mentoring a beginning beekeeper. F. Assisting a youth group (4-H, FFA, etc.) with a beekeeping project. G. Working at beekeeping exhibits open to the public. H. Judging honey or other bee products at a fair or other local competition. I. Performing a special program or activity approved by WASBA. A maximum of 50% of accumulated units may be obtained in one category. Inmates of state correctional institutions can accumulate 75% of the points from one category. Categories A and B: 1-unit equals 1 hour, with a maximum of 3 units per presentation. Five units for an article published in a national magazine; or publishing a state or local association newsletter for one year; 2 units for an article published in a local or state newsletter as specified in Category C.
15 units for serving as an elected officer for one year, and 5 units for serving as a trustee/executive board member for one year as specified in Category D.
1-unit equals 2 hours with a maximum of 3 units per recipient in Categories E and F.
1-unit equals 2 hours in Category G.
1-unit equals 1 hour in Category H.
The number of units in Category I will be predetermined by WASBA based on the nature of the activity.